Placing the owner's need for performance and comfort fully central, Xtenders and Vripack pushed the limits of boatbuilding with the delivery of world's first autoclave pre-preg carbon built Limousine Tender. The carbon LimoTender 8.0 now proudly tenders to M/Y Global (ex-Kismet). As a former Olympic sailor Xtenders' founder Herbert Dercksen knows that weight is killing so he made sure that the LimoTender got built to the highest level of modern carbon fiber pre-impregnated construction. Known from various competitive race scenes, uni-direction carbon is exceptionally strong and renowned for its ability to deliver the ultimate performance in the most challenging conditions while keeping weight to a minimum. No wonder it's the material of choice for the Dutch high performance tender builders. Understanding the job she will perform, which is carrying her owner and guests under all conditions to and from shore, the LimoTender combines exhilarating performance with comfort. Light weight brings high speed, outstanding handling and manoeuvrability, crucial for any people carrier. Light weight also leads to a reduction in engine size, lower fuel consumption and noise levels. And, let's not forget, it allows the tender to sail at 40 knots with 10 guests and 2 crew-members on board. Vripack designed her hull with a sailboat-like entry angle, flaired bow and deep V aft ship pushing water away from the hull lifting the boat out. Her hull lines reduce slamming and redirect the spray. For the exterior design Vripack drew inspiration from the outlines of the mothership while her size is carefully aligned to perfectly fit the existing tender garage. Her streamlined exterior embodies speed and her smart and super-efficient lay-out breathes comfort and functionality. In every respect a masterpiece of functionality, or as Sam Mandeno - Chief Officer of M/Y Global stated; "The LimoTender has a distinctive look which is both unique and modern. All crew-members have been blown away by how she looks and above all how she performs". Established in 2008, Xtenders has been an expert in high quality carbon fibre tenders. They work with a dedicated team of 16 employees and have successfully delivered over 50 tenders from 5,2 up to 16 meters. Currently they have 13 future tenders under construction. Established in 1961, Vripack has been a leading full service yacht design, naval architecture and engineering studio with over 7000 projects under its belt. Vripack focuses on realizing better ships in less time for private customers and yards world-wide. "At Vripack we believe that a good design should not meet all requirements, it should surpass them in order to create a boat that goes beyond dreams. We don't just design yachts, we Engineer Fantasies." 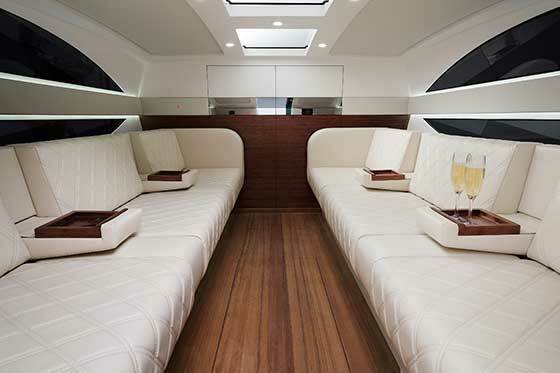 "An interior for a Limousine tender is different than a normal yacht interior because, like in a car, your eyes are very close to the details crafted. Vripack therefore gave her a light and tranquil feel with off-white Bentley stitched leather bouncing off the matt finished dark woods. To connect with the water the Dutch Studio inserted a window along the waterline making you feel like flying over water. No Limousine is ready without a refrigerated-champagne-cabinet, custom mood lighting, air conditioning and various multimedia appliances."